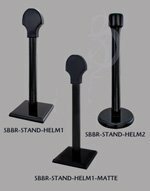 For a low price you can add a personalized engraving to your helmet stand. 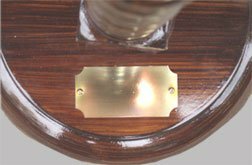 We will apply 2.5 inch by 1.25 inch solid brass plate to the helmet stand engraved with your personalized message. This makes for a truly wonderful gift or award. Just click-on the engrave button next to the helmet part number and use our engraving utility to enter up to three lines of text in the font of your choice. In the year 2000, Romans proved more popular than Chinese. That was the year when Ridley Scott's "Gladiator" beat out Ang Lee's "Crouching Tiger, Hidden Dragon" for the Academy Award, and Gladiator's leading actor, Russell Crowe, took home the award for Best Actor. The awards were well deserved; Gladiator's Maximus character was the best gladiator character since Spartacus. 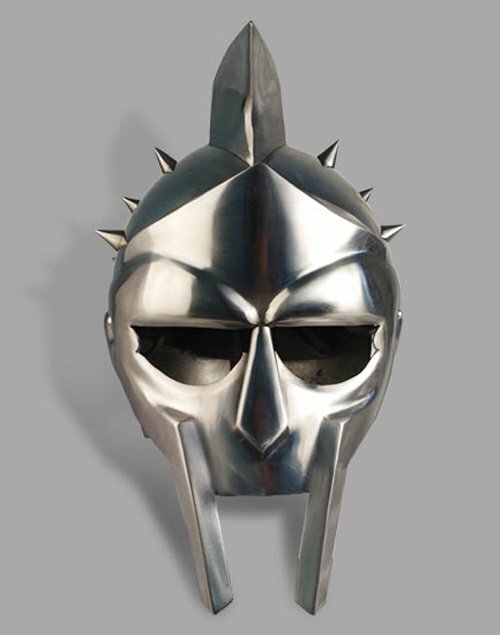 But not even Spartacus wore a helmet as cool as this one. 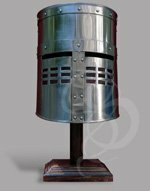 Although technically not a standard gladiator helmet, this piece most resembles the "cavalry sport" helmets worn by Romans and Romanized Celts. These Life-like armored masks were carved to resemble human faces, and were used both for cavalry training exercises and, early on in Roman history, for battle. Among sons of soldiers, these masks were also used by big brothers to scare the bejeesus out of little brothers by popping out of the latter's closet and screaming while wearing one. (Sure, there's no historical evidence to back this up, but you have to know that sort of thing went on). This helmet captures the spirit of that one worn by Maximus in his first few gladiatorial combats, when his identity as a fallen Roman general was still a secret. One of the most dramatic scenes in the movie is when he removes it in front of the Emperor Commodus, revealing his identity and declaring his name and rank. This helmet is made from stout 18-gauge, high carbon steel. Decorative brass finials stud the entire back and top of the helmet, lending it a much more fierce look. A savage spiked crest curls forward from the top of the helmet giving it a truly ferocious profile. 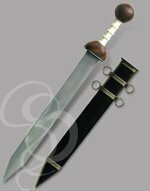 Material: High carbon, 18-gauge steel. Brass Studs.